* It is appropriate for stress relieving of various steel or non-ferrous materials. 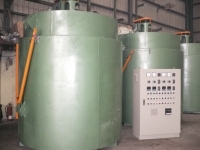 * It meets all kinds of annealing processes after quenching heat treatment. * Convection system of special design makes temperature in furnace very even. * Using ceramic fiber for lagging material, insulation efficiency excellent, weight light and temperature rising very quick. * Forced temperature decrease design is available, which save output time, increase production and reduce cost in business. * Excellent sealing ability, protection atmosphere may be inject into it.